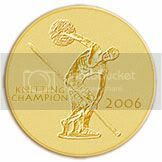 Surely I must be the last person to chime in with some version of the Great Stash Knitting Project of 2007. Most famous is probably the Knit From Your Stash 2007! over at Wendy Knits, but there are others out there. And I have to say that I'm getting intrigued . . . You know that this year I've been thinking a lot about stash. Moving it all cross-country will do that do a gal . . . And you may have seen that I expressed some concerns about the stash of patterns in the form of books and magazines that I similarly carted cross-country. The thing is, I have a lot of yarn. Maybe it's time to knit some of it. And so I'm making something of a resolution for myself - in mutual sympathies with the others out there in blogland doing similar things - to declare 2007 The Year of the Stash (and Chuppah). There's only a slight flaw in my plan . . . Turns out I had to buy some 87 skeins of yarn to make it seem feasible. You see, in order to continue with the Book-Project-of-the-Month Plan, I needed some specific kinds of yarn. So one evening in the last week of 2006, in glorious anticipation of a whole year of stash knitting, I pulled out the books I intend to visit in the coming months. Vintage Knits, Knit 2 Together, Hot Knits, Folk Knitting in Estonia, Loop-d-Loop, and, um, some others whose names I'm blanking on at the moment. 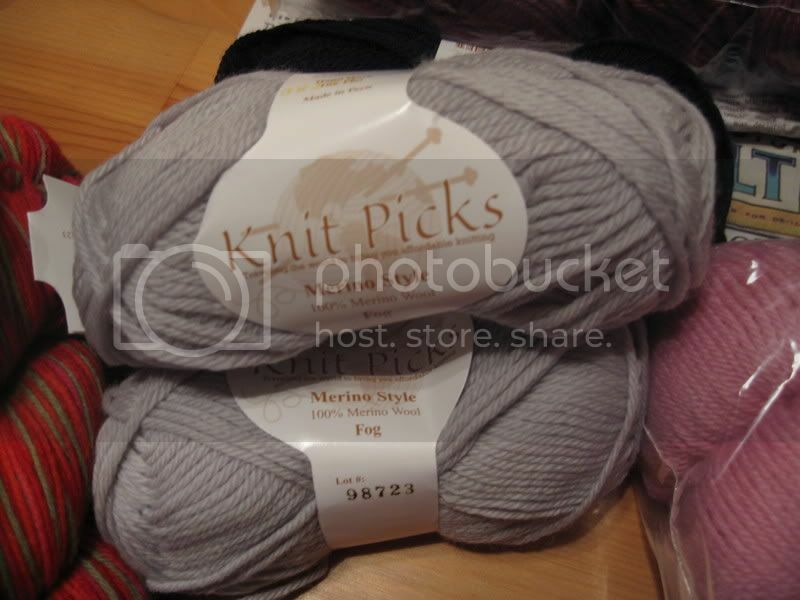 And I ordered appropriate yarn for a number of projects. Sounds fine, right? Just a slight complication . . . I neglected to make notes on exactly which projects I was pursuing. I guess I thought it would be more obvious than it really was . . . But I'll figure it out. Someday. In the meantime, want to see what I got? 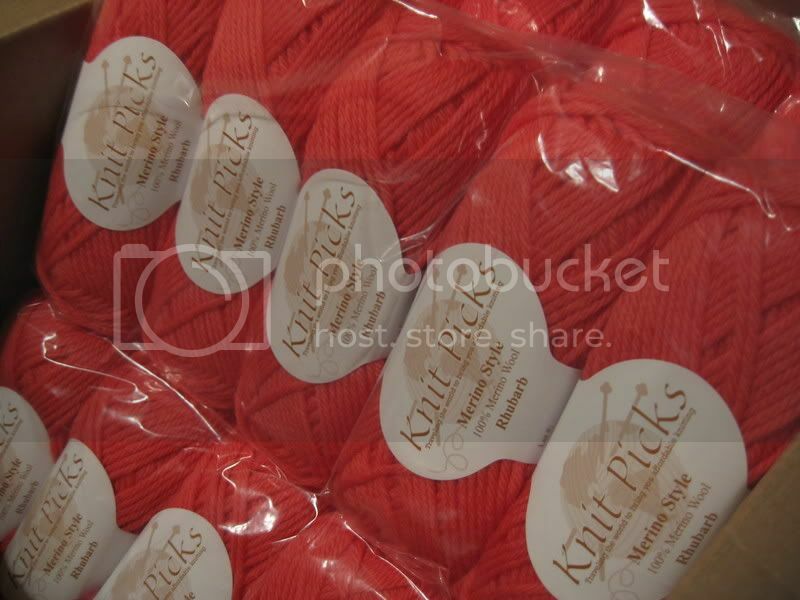 It was a big Knit Picks order, largely driven by my desire for Merino Style (see below) and the quest for free shipping. 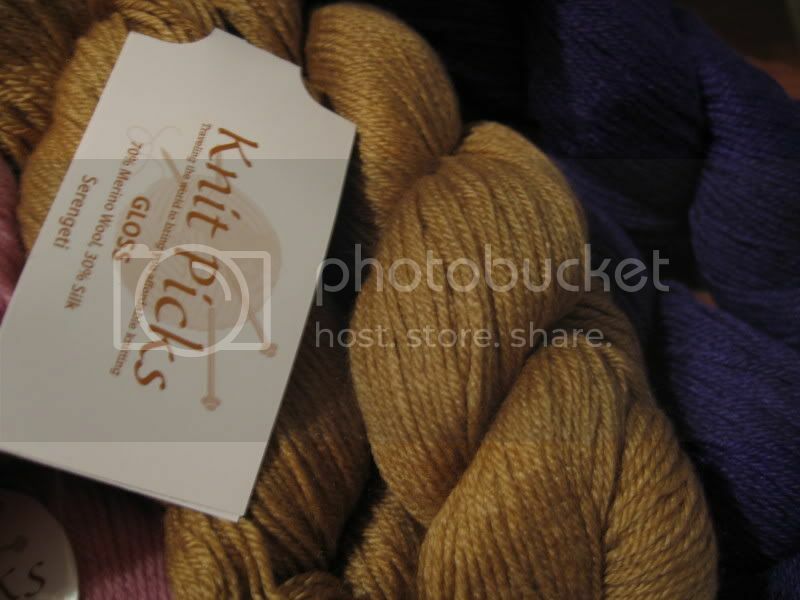 Above is Knit Picks Gloss in Purple and Gold, 2 skeins of each. I think I bought it because it was on sale. Or maybe I was thinking some sort of colorwork mittens or gloves? It's quite a lovely yarn however, and I'm very pleased. My favorite of all is the Ambrosia on the right. The flash makes it seem brighter than in real life, where it is a perfect petal pink in cashmere. It's destined to become a Rowena cardigan from Knit 2 Together for a gift later in the year. Another purchase was a bit more prosaic - remember the Checks and Charms hat and mitten set I made Kate D.? Well, I had plenty of the accent colors left. 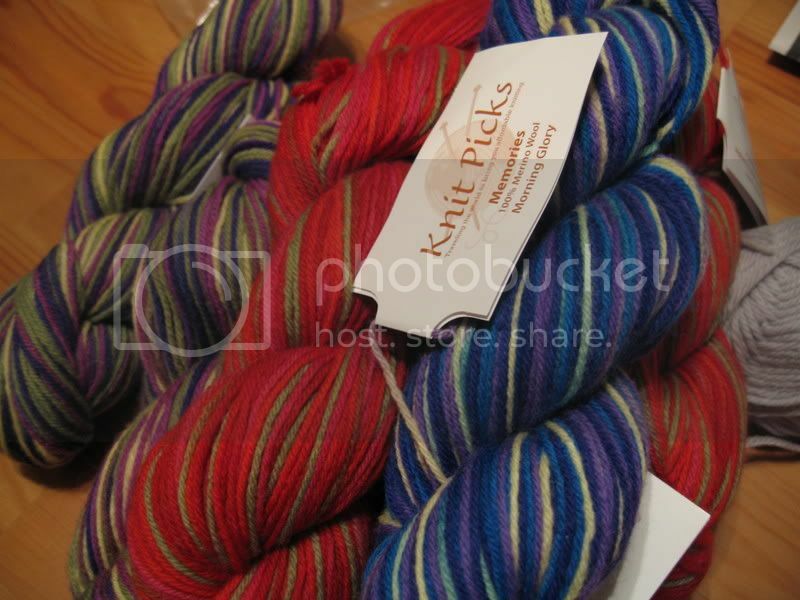 So just in case I decide that someone else needs one, too, I picked up the necessary skeins of the main colors. I mean, that's hardly even really new yarn at all. It's practically yarn I already had. As well as a single skein of solid gray sock yarn (not even pictured) that I need to complete a pair of socks. Doesn't count . . . But speaking of socks, you didn't want me to have cold feet, did you? I'd heard pretty good things about Memories, and I liked a few of the colors (which are tragically represented by my flash on the right), so I picked some up. Because even if I don't make socks from these, I can always give them as gifts, or in swaps, or something. Everybody loves handknit socks (except the beau, who is making noises again about how everybody got handknits for Christmas except for him). Finally, the purchase which drove them all . 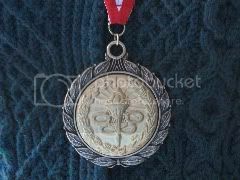 . . and the one I am least sure about. I want to make a cardigan in Knit 2 Together, or maybe a cardigan from Vintage Style (my memory is totally failing me on this one), but I needed a DK wool, and I've had good experiences with Merino Style in the past. I agonized over the color choices, and finally setled on Rhubarb. It looked like a nice deep, mature sort of pink. Branching out from all the blues and purples and pastels I have, but in a good way, I thought. Tell me honestly - is this a good way? Granted, I haven't seen it in natural light, so I am withholding some judgment on this, but I have my doubts. It just seems a little incredibly glow-in-the-dark bright. And even if it would be branching out in a good way, it doesn't go with anything in my wardrobe. So maybe not . . . Weigh in here, folks. And not only that, but what color instead: Frost? Tide Pool? More Petal like the Ambrosia? Iris? Or should I go Neutral - Cinnamon or Fog? Because, really, this is like a first date. If you have this many doubts on the first date, you never make it to the swatching stage. I really like the Rhubarb. Actually, I have been equivocating over the Cornflower I bought (10 or 20 skeins, I'll have to check). If you decide that you hate the Rhubarb, and if Cornflower is in the running for you, I'd be happy to trade you. My email address is on my blog. Anyway, have fun with the new stash. I did the same thing last year, I knit mostly from stash, not an entire year of no purchases, but stocked up the year before, so it was much easier to do so. Even now, I don't feel like I have to buy every yarn out there, because I know I have so much to work with here. That doesn't stop me from buying some yarn or wanting more, but it is helpful to have enough to work with that I like. Good idea to plan ahead and get what you'll need to knit from your stash. Love the sock yarn you picked. As for the Rhubrab, it is awfully pink. It would look great paired with black or brown to liven up your wardrobe. I think you should go for it. Of course if you want something that goes with everything, a more neutral choice like Cinnamon or Nutmeg would be good. Maybe if you mix it with another color it won't be so vibrant. All the yarn is droolable. Nice work! Yummm...am I missing something about the Chuppah? You are so smart to do a big shopping before "Knit From Your Stash" And you got some wonderful yarn - I have, well had, the exact same 2 gloss colors... the purple is well on it's way to becoming the shell socks and the gold is my daughter's mittens - I LOVE that yarn! I am jealous of your Ambrosia purchase - that is one I don't have and now can't get for a LONG time. I LOVE the Rhubarb...I just went to look at the color on their site too. It will make a beautiful cardigan, but of course you must decide if YOU will wear it. Love the stash enhancement! The Rhubarb is pretty bright, but only you will know if you would wear it. I personally would go more for the neutrals. 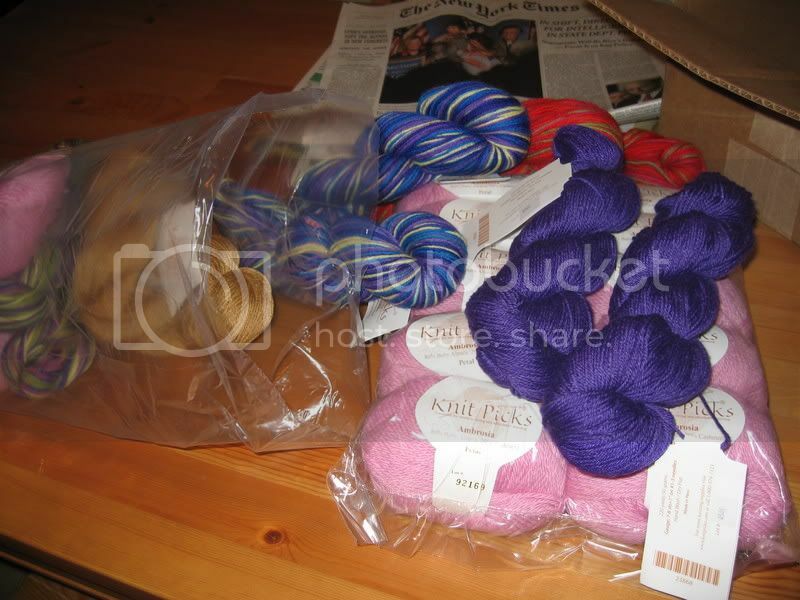 BTW, I have, on several occasions, ordered yarn and then totally blanked on the projects when the shipment arrives. Going back through the books will generally remind me. Nice to know I'm not the only one. The Rhubarb is pretty - but it's something you ought to really love or, I think, you won't enjoy it at all - sort of like wearing a hat (not the winter kind) in public -- it takes being "up to it" if it's not your usual thing. or Hollyberry - it'd warm up your palette without shouting, and goes nice with blue tones and probably some of the pastels you usually wear. My .02 because you asked -- your first date analogy made me laugh! The rhubarb does seem a bit bright - I was disappointed by one of their colors last year - it was way more purple than I thought it was on my monitor, but the switched it for me with little trouble (I had to pay to ship it back and then to have it reshipped, but I think it was just a few dollars each way). I think the fog is very lovely, a nice neutral. Your title reminds me of the old Mike Myers Saturday Night Live sketch: "All Things Scottish (and pizza)" ! Hahahahaaa...that is so totally something I would do; pick out projects, buy the yarn, and then forget which projects I intended to do. And not have bothered with writing it down because THIS time, I'm going to remember. If you are questioning the yarn choice this much now, you may want to swatch it first. It would be sad to spend a long time knitting a cardigan and end up not enjoying the knitting or loving the garment because of the yarn choice. Just my $.02. I love your color choices! You definitely have the "eye". I'm a horrible person to ask because all I see in those color cards is the green!!! Moss would work for me, but not everyone is a green person. Or has a billiard green carpet through their house. I don't have a very good track record with buying yarn via the Internet, so I don't think I should weigh in on this. I would say that it's probably a good idea to go with your first impulse. I say go for the rhubarb. It will never be an everyday sweater, but I know you have your pinky-orange days, and this will be just the sweater for those days. Why play it safe? You're in the navy. There will always be another cinnamon/blue/pale green sweater in your future. Hmm. 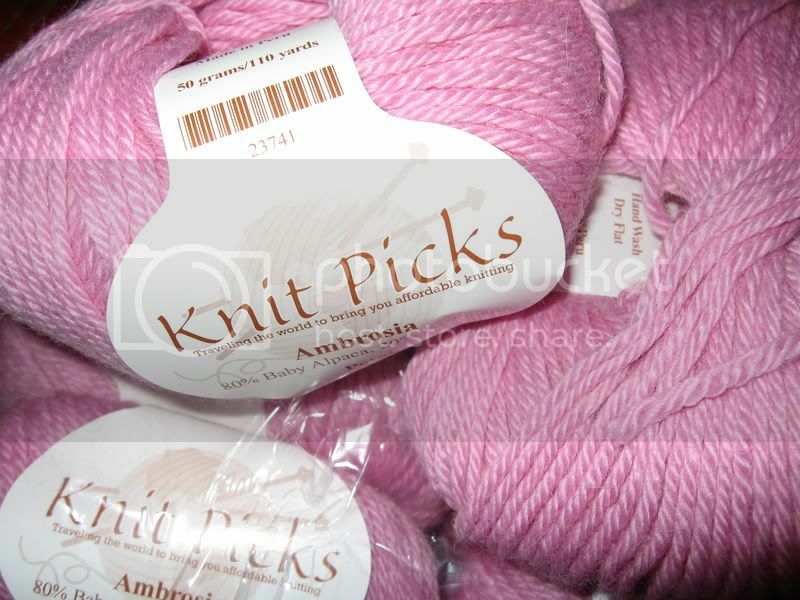 Well, first of all I will suggest that on your next Knitpicks order you throw in a Merino Style color card. Second, I will say that I think you can pull that color off. I could not, but you could, and I think it would look great. I don't know what the cardigan looks like, but I think that color would go with jeans (obviously), not-too-light khakis, and brown pants. You must have those in your wardrobe, right? Perfect! It goes with your wardrobe. Everything else looks great as well! I have used Ambrosia before...yum.